Despite this, I'd really not been following the hype about the upcoming Transformers movie. But the new trailer came out today and I have been converted. The flying robot doing the flip over the bridge is particularly hot. Michael Bay's not my favorite director, but I think Armageddon is a misunderstood work of genius. So as of today I am filing my Statement of Excitement with the Federal Commission on Fanboys. May God bless America and here's hoping "The Touch" doesn't end up in the soundtrack. I always thought that Dirk Diggler wrote "The Touch". It was comforting to think a song that corny was fictional. Oh well. Same guy who wrote that song is apparently doing music for the movie. So that's concerning. 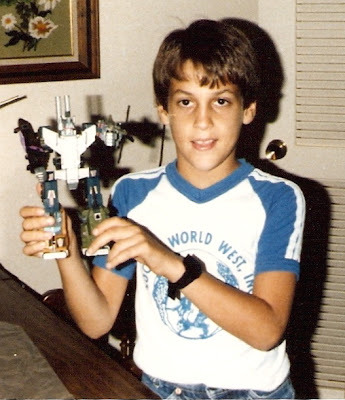 And that's actually the Combaticons in their combined form of Bruticus that I'm holding.